The Why layer serves as the foundational design element that subsequent layers must complement to produce a coherent whole. Many talent strategies have lots of factors but they’re treated as equal and I think that’s a mistake. Coherent approaches to design require primary and supporting elements. Organizational vision and individual life purpose are two sides of the same Why coin. The journey towards organizational adaptability begins when founders and executives answer Simon Sinek’s famous question “Why do we exist and why should people care? The goal of business is to do business with those who believe what you believe.” A person’s life purpose is one’s calling, or unique contribution, in life. It is a way of being and acting that defines your character, clarifies, motivates, and fuels you. Interestingly both are about contributing to something bigger than oneself. As Dan Siegel said “Purpose and value come from service to a larger good”, so ideally one’s life purpose is fantastically synergistic with that of one’s organization. As THNK Insights said “It is inspiring to discover others who share the same passion and purpose as you.” Most people do not have their life purpose defined, so it’d be fine to start with people’s passion (maybe they’re super committed to their craft) and then see what’s clarified through additional reflection and development work. Neuroscience has a concept called “Tend and befriend” that illustrates as social creatures we are wired to want to nurture and care for others. In fact, the circuits in our brain activated when we interpret meaning are the same circuits activated in social dynamics. A compelling vision statement connects with our biological need for affiliation and contribution and has the added benefit of lessening your ego’s grip on behaviour. Importantly, discovering your organizational vision or life purpose will come from your heart, not your head. Truly resonant visions inspire; people want to tell others that they’re part of something so moving. Great vision statements are simple and pure enough that you could share them with Grandparents and they’d both instantly understand and be proud of you for helping make it happen. Sadly, much of today’s organizational life and our world is focused on the material and individual aspects, not meaning. The vision statements that could be applied anywhere don’t cut it, and it’s better actually to not have one than to have a hollowed-out, cynicism-provoking shell. The vision for an organization ideally does not change that often, although more specific tools like MVP, UVP, key focus, or even mission can be updated as your targets evolve. Having a clear and compelling WHY helps to match an organization’s purpose with that of candidates and employees. You can tell if you’ve got a compelling WHY by feeling inspiration and commitment to something noble and larger than yourself. Google’s “is to organize the world’s information and make it universally accessible and useful”, and Amazon’s is “to be the Earth’s most customer-centric company, where customers can find and discover anything they might want to buy online.” Contrast these poorly constructed statements with a few inspiring ones to illustrate how clear, truly resonant statements avoid corporate-speak and generate energy and commitment from stakeholders. Without this you may notice higher turnover, low accountability and motivation, or petty politics. You do not achieve organizational vision; it’s a source of energy and inspiration. Your current product / service and by association your current understanding of either your minimum viable product (MVP), or key company focus (get to 30% more customers! ), or mission are all more tangible tools to help make the vision a bit more clear to people. There’s an art to using these tools properly; the key is to use them with a growth mindset to engage and reflect upon your progress, and not as a binary yes/no definition of success (if we achieve this we’re a success….). Not achieving something can be positive if the collective team learns something beneficial from it. HOW DO WE CHOOSE TO WORK AND LIVE? The second layer of the model, the “HOW”, is about the character and capability of people and organizations.This includes values and operating principles, brand, capabilities and systems, the ability to leverage the full range of our humanity and relationships. Character and capability are two sides of the same coin, because whether articulated or not, your character is reflected in what you value and how you choose to work or live. If the first layer of the Golden Circle explains why we exist and provides important motivation to stakeholders, the second layer helps us progress towards that vision in a way that feels resonant with what we value and is intentional with approaches for success in today’s world. This layer is often missing or perhaps a few elements are articulated but not thoroughly fleshed out, or integrated with each other. This is my take on Simon’s model but I feel it’s especially crucial to address all of these elements in an integrated way, especially as you scale the organization or merge with another, because without it there will be a vacuum of context that supports people creatively solving problems and contributing within key parameters. People need “to get stuff done” and will make the best calls they can by implementing approaches, processes, tools, etc. from their past organizations without perhaps being aware of why those approaches were in place, or any other important consideration about how this particular particle relates to the whole. The key markers of success for this layer are coherence, resonance, and integration. Use design thinking to envision a coherent approach to your business; everything from brand to customer experience should make sense individually and as a total experience. On the individual side of the model you’ll want to nurture people to be self aware and intentional about living their life in a way that is aligned with their personal values and those of the organization, but more broadly to be truly conscious of their strengths, interests, passions, impact, relationships, etc. Ken Wilber would say that we’d want to invest equally in both quadrant one and two for people, but unfortunately most companies just invest in skills. That’s a waste because ultimately the inner game (q1) drives the outer game. Ideally people love working with this organization because they believe in the same things and love the work itself. This layer is about walking your talk! Are you actually running your business aligned with these principles? Are you making tough calls because of your principles? This is not a one-time thing, like a fiscal year road map roll-out; it’s continuous, a shared reflective exercise about shared identity and choice that builds strength over time as people make decisions, see the impact, the world changes, etc. Values and operating principles are the most talked-about, and most inconsistently implemented, elements in this layer. 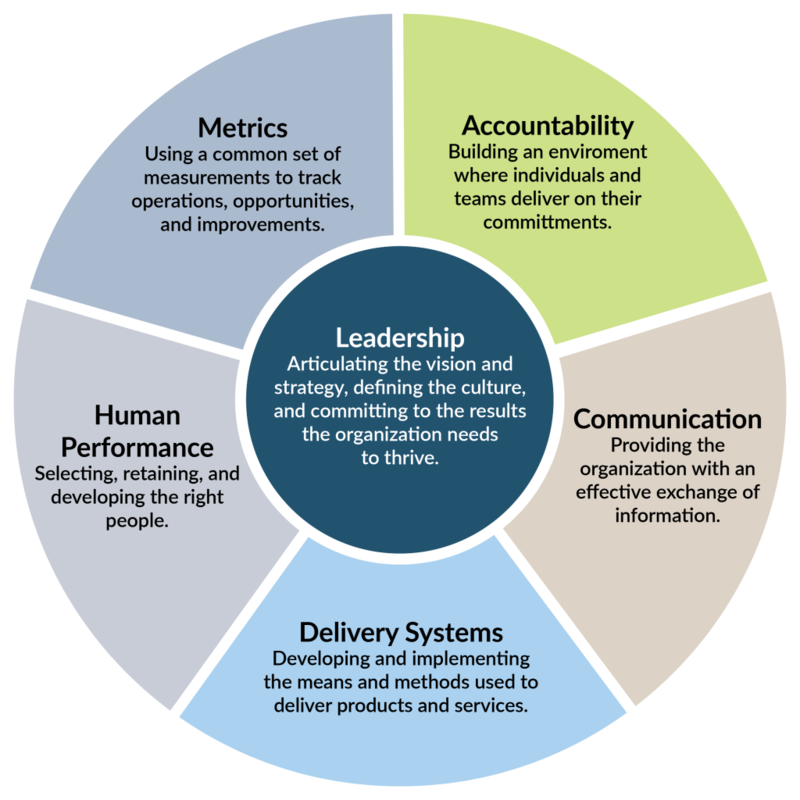 This graphic comes from The Leadership Circle and identifies the primary organizational systems leaders must continuously address to ensure execution and ongoing development; vision and values are core elements to the leadership system within any organization. Many leaders have no awareness of their own purpose or values, so there’s no personal experience about the benefit of designing and living your life via values-aligned choices to inform their organizational work. Some leaders default to “standard” organizational values without there being any sizzle or resonance to them personally. When push comes to shove their true values, or often their fears, inform their decisions. The best leaders are those who are clear on their values, who live their lives in a way that honours their values, and who can take that experience and help create organizations that are built upon the true personal values of the founding team. Values are worthless unless you help make them tangible to people via their day-to-day ways of working, and everyone believes in and follows them. Actions speak louder than words; we can say whatever we want but our actions illustrate our values (even if we’re not aware of those values). Choices are expressed in our beliefs we hold and associated choices we make about our products and services, and in the relationships with our stakeholders: our internal team, customers, key partners, and the broader community. In other words, this is where the rubber meets the proverbial road. Mapping our values across these beliefs, choices, and actions for each column can be collectively referred to as Values Mapping, or if you’re inside an organization you might prefer the term Operating Principles. They are, by design, boundaries for how we want to run and scale our business so we make them real and specific and reflect and update often. They are owned by everyone inside our organization and are a huge influence on desired culture. Individuals who prefer a more sensing, bottoms-up, literal way of making sense of a situation find these columns an easier starting point than something more conceptual like the definition of the value. When I work with clients we sometimes use a simple table to help display them, but it’s more important to simply capture these elements and relationships in a way that is evocative and impactful to your team. Every client finds this work satisfying, if not exhausting. It’s not the kind of stuff most people are used to considering. Some are rightfully cynical or skeptical, while others immediately get excited and want to get to work. It also takes a while to get to V1, but doing it this way is a brain-friendly, balanced approach: the values themselves evoke meaning in individuals that result in emotions felt in the body and carried up into the right side of the brain via the vagus nerve. The right hemisphere, broadly speaking, is home to connection, wholeness, and emotion, while the operating principles appeal to the left hemisphere, home of our words, structure, and analysis. First Round Review offered some helpful tools to think about your brand: “Lean Branding author Laura Busche comes closest to an actionable definition: A brand is the unique story that consumers recall when they think of you. This story associates your product with [your customers’] personal stories, a particular personality, what you promise to solve, and your position relative to your competitors,” Busche writes. “All human aspirations are opportunities for brands to build relationships.” It’s therefore paramount for the People & Culture team to work with organizational leaders to translate your brand into a tangible combination of motivated, engaged, and capable people leveraging shared wisdom, tools, process, capital, technology, etc. to reliably and at scale produce the unique value proposition that customers value as part of your brand. Differentiating – This is your secret sauce, the tangible elements your customer experience as your brand. It’s probably not more than 3-5 things but could easily just be one big thing. Exponential – Up until I read this book I never considered something like exponential capabilities but it makes complete sense to me now. I’m going to consider these the “up and coming” capabilities that people need to pay attention to or risk missing out on new ways of working or customer expectations. The earlier examples of exponential capabilities are illustrative, but by definition as things advance so too will the expectations of differentiating factors. Growth – As you scale, an organization needs to learn how to do certain things well, like managing remote multi-cultural workforces, multi-country tax planning, crisis management, lobbying, etc. When you lead others at scale you also need to intentionally cultivate your growth capabilities (managing managers, for example) and your capacity of mind (more on that later). I think it would be a good thing to see more executives identify their company’s capabilities and then conduct a risk assessment to see which areas need to get addressed first. Achieving your desired culture and capability is most tangibly expressed through your organizational systems; form follows function. It’s “how” you get work done with a group of people, and is where an intentional application of user-centered design principles can help create world-changing, authentic, highly adaptable organizations. It’s also an area where I see the most opportunity, especially for those leaders committed to organizational adaptability. Many people simply adopt the approaches of past organizations without contemplating how that impacts other key systems or desired results. Netflix’s culture deck went viral precisely because they were articulating a comprehensive view of their principles and related processes and programs. Leadership is the core system; the effectiveness of the leadership system determines the effectiveness of the other systems. Although ~ 80% of leadership competency models are the same, it’s that 20% that truly makes them helpful to helping people answer the question of “What’s a great leader look like at our company?” Wal-Mart, Amazon, and Nordstrom are all retailers yet their definitions of what a greater leader will vary greatly. They’re all equally valid, but effective leadership is always in service of your vision, values, and brand. Regardless of how you feel about Amazon or Jeff Bezos, they’ve done a great job of articulating their leadership “how”. I firmly believe that as our lives continue to further digitize and speed up, we will see organizations facing adaptive challenges as a greater percentage of their focus. The new normal will force new ways of working, like the organizational systems mentioned in Exponential Organizations and Reinventing Organizations. Wholeness in the context of organizational and human development means three big things: (1) the celebration and integration of all aspects of a person, not just the professional or transactional, to help us achieve our vision (2) the ongoing development, flaws, quirks, fears, and aspirations both as individuals and as a collective and (3) we’re stronger together only if people choose to invest in the whole and to see it as something worthy of care, and beneficial to them; the journey from me to we, if you will. Some of you may find that definition a bit woo-woo and inapplicable to today’s world. I suspect that has more to do with bad prior experiences or your own fears around vulnerability than an appreciation that psychological safety and a shared sense of ownership to the organization hugely contributes to creativity, risk taking, ownership, perspective taking, and rapid learning, all of which are crucial for solving adaptive challenges. Embracing wholeness is essential for a resilient, creative stance in the world, an awareness of both the components and dynamics of many human systems in our life and our contribution to them.Wholeness fosters an ability to create from anything and all situations without losing sight of principles. It calls you to focus on your gifts and passions (hopefully filling your day with many flow state moments), and supports a growth mindset that is in turn essential for obtaining mastery, and the shared ability to leverage diversity of perspective, skill, and experience to learn, create, and grow (adapt) better than the competition. As our machines get smarter and more capable our uniquely human ability to connect, love, play, inspire, grieve, strive, and learn (to name a few) become even more important. Our character is expressed through our actions and especially so through our relationships, and it’s those relationships that are especially powerful in a highly networked society. It’s not just 1:1 relationships but 1:many via social tools, and through community and collaboration efforts and tools, combined with technology, that can deepen and widen our connection with stakeholders in profoundly new ways. The authenticity and uniqueness of your brand gets expressed via relationships and I bet we’ll see someone try and quantify them somehow (biomarkers automatically uploaded based on our interactions with staff?). I can’t see this being used just for commerce but also for improving our world through global coalitions that break down barriers, mashing up cultures and perspectives in awesome new ways. I believe the ability to be in healthy relationships (social capital) is more important than raw intelligence, and is one reason it’s so important to continuously develop leadership and team skills. It’s why you should actively share your knowledge with others, attend conferences, participate in social media, go on trips to visit customers and partners, and generally do your best to get out of the building. We do this with a few beliefs about what makes for good relationships: Candor, trust, openness, play, and an unwavering commitment to excellence. One final note about the How layer: The company should be totally dedicated to only recruiting, developing, and retaining employees and key partners whose values, leadership, relationships, and wholeness are synergistic with the organization’s “how”.